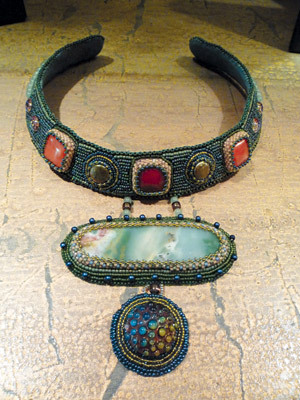 Beaded jewelry artist Nancy Lawson spends many hours creating striking and intricate necklaces, bracelets and table jewelry out of mostly natural stones and beads. She carefully weaves and embroiders exquisite beads with needle and fishing lines to craft wearable, long-lasting pieces. 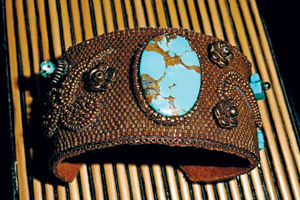 This beaded cuff consists of a snakeskin turquoise stone surrounded by smaller turquoise embellishments against a background of appliquéd beaded scrolls. Each of the bead embroidery jewelry items, which generally range from $125 to $350, possesses a stone or vintage piece as the focal point. Lawson uses a variety of decorative materials to create her wearable works, such as freshwater pearls, glass beads, Swarovski crystals, sterling silver and dichroic glass. Stones she uses include dog tooth amethyst, Russian charoite, ammonites and cabochon. When creating a piece, Lawson said her message is different depending on the individual. Interpretations of her jewelry style ranges from Art Deco, Greek to Egyptian. Depending on the style and detail of a jewelry piece, Lawson takes around 10 to 20 hours to create a bracelet and up to 40 hours to make a necklace. Incredible detail is on each piece, which contain between 1,000 and 5,000 beads. An ocean jasper gem stone is the centerpiece of this “Oceana” necklace, which is attached to a glass drop. The neck collar is made up of sunstones, freshwater pearls, aventurine and dichroic glass. All photos by Nancy Lawson, unless noted. Lawson does two types of bead work: bead embroidery and bead weaving. Lawson said she uses thin fishing lines to embroider her work because it is stronger than thread. Most of the small beads she uses are colored glass beads. Her favorite colors to use are deep greens, rust and turquoise. She then stitches the beads onto suede, leather or microsuedeleather. She also makes bead-woven mesh necklaces and bracelets. The process of bead weaving consists of sewing seed beads on a loom or using a number of off-loom stitches. The jewelry pieces are not as delicate as one may think, Lawson noted. “Though the beads are mostly glass, they are very protected by the backing in the bead embroidered pieces and the beadwoven pieces are very soft and flexible, so unless they are hit very hard on one bead, they do not break. I use very light fishing line to sew them, so it is very strong, however, if someone caught a part of it, it could loosen a couple beads,” Lawson said. 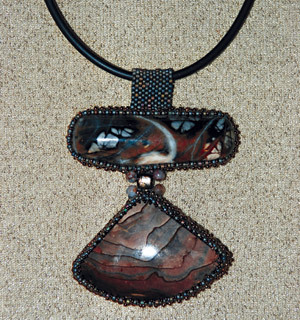 A pendant with Blue Biggs Jasper and Owyhee Canyon Jasper. The Chicago-born, Miami-raised artist settled in San Diego after teaching fourth graders and traveling as a consultant. Lawson, who retired six years ago, was looking for her creative calling when she came across a bead store in Santa Fe and was inspired by the beauty and intricacies of the beads and stones. She began to create beaded art jewelry as a hobby and then displayed her work at local artist events. The positive response encouraged her to get more involved in community art fairs and shows. Lawson has participated in a variety of juried shows, such as the Talmadge Art Show in Point Loma and La Jolla Art and Wine Festival. This summer, she won first prize at the 3D Art Exposition, an artist event that takes place in conjunction with the U.S. Sand Sculpting Challenge at the Cruise Ship Terminal Pier in downtown San Diego. Her work has also been featured at the Brandon Gallery in Fallbrook and at the Bazaar del Mundo in Old Town. On January 26, 2013, she will have a trunk show at a La Jolla gallery, Mangelsen – Images of Nature Gallery. To learn more about Lawson, visit beadartistrybynancy.com.